Amer Abdulaziz’ Phoenix Thoroughbreds paid $2.1 million for a Medaglia d’Oro colt who is a half-brother to 2015 Breeders’ Cup Distaff (G1) winner Stopchargingmaria to top Thursday’s fourth session of the Keeneland September Yearling Sale. 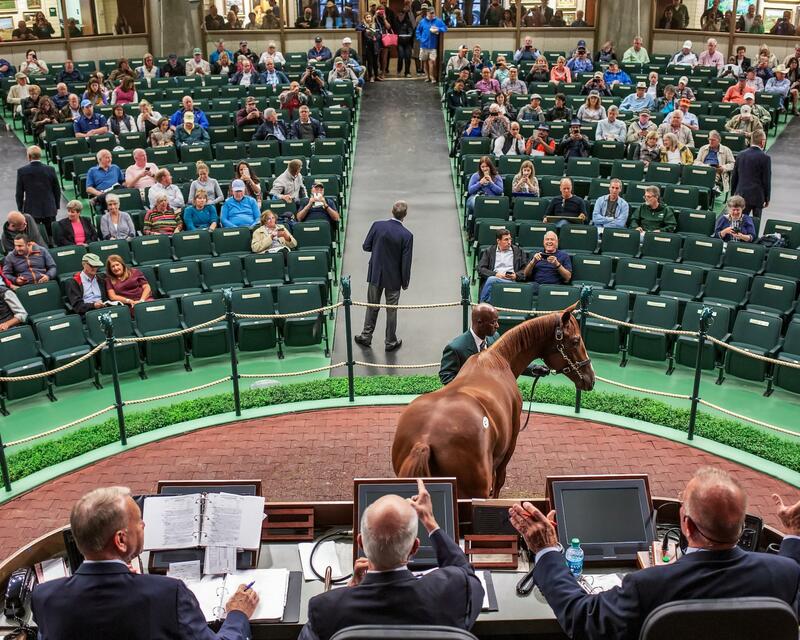 Six million-dollar horses were sold during the session, the final day of the premier Book 1, increasing the total number of seven-figure purchases to 26, the most since 2007, and driving double-digit gains in gross, average and median prices when compared to last year’s Week 1. Through the auction’s first four days, Keeneland sold 596 horses for gross sales of $216,813,000, up 10.26 percent over last year’s $196,645,000. Average price of $363,780 increased 25.98 percent over $288,759 in 2017. Median rose 50 percent, from $200,000 to $300,000 this year. The new September Sale format also proved successful. Last year’s September Sale opened with a one-day elite Book 1 followed by a three-day Book 2. This year the format was adjusted so Book 1 spanned all four days of the sale’s opening week. A total of 1,203 yearlings were cataloged in Week 1 in 2017 versus 989 in Week 1 this year. “Our new format worked very well,” Russell said. “Our goal was to reduce the number of horses cataloged in Week 1 to give buyers the chance to get around to look at them all and for consignors to be able to show them in a less cramped area. It worked very well from start to finish. We sold fewer horses for more money, more average and more median and had less buybacks. So all indicators are very positive. On Thursday, Keeneland sold 139 yearlings for a total of $49,475,000, marking an average of $355,935 and a median of $300,000. The $2.1 million session-topping colt is the third-highest-priced yearling of the 2018 auction behind a $2.4 million War Front colt sold on Tuesday and a $2.2 million American Pharoah colt sold Monday. “We liked this colt so we decided to go for it,” Abdulaziz said about today’s high-seller, who was consigned by Taylor Made Sales Agency, agent for Stonestreet Bred & Raised. The colt is out of the stakes-winning Montbrook mare Exotic Bloom. “Obviously (we were going to battle for him),” Phoenix’s Tom Ludt said about the bidding competition for the colt. “We do our work; we work really hard. The ultimate answer and the compliment come at this stage with who we’re competing against, and it just comes down to how much you’re willing to stretch. With total sales of $8,842,000 for 22 horses, Taylor Made Sales Agency was the leading consignor on Thursday. Gainesway, agent for Stonestreet Bred & Raised, consigned a colt by Medaglia d’Oro out of champion Dayatthespa, by City Zip, that sold to Godolphin for $1.6 million. Medaglia d’Oro is the sire of three of the six highest-priced yearlings sold Thursday. The two most expensive horses were bred by Barbara Banke’s Stonestreet Thoroughbred Holdings. Godolphin went to $1 million for a Medaglia d’Oro filly consigned by Runnymede Farm, agent. She is the first foal out of the Street Cry (IRE) mare Esprit de Vie, a daughter of Irish highweight Irresistible Jewel (IRE). Esprit de Vie is a full sister to Group 3 winner Princess Highway and a half-sister to Group 3 winners Royal Diamond and Mad About You (IRE). Runnymede purchased Esprit de Vie for $500,000 at Keeneland’s 2015 November Breeding Stock Sale. On Wednesday, Runnymede sold a filly by Uncle Mo out of Grade 3 winner Bizzy Caroline, a half-sister to champion Lady Eli, to Godolphin for $1.1 million. Prior to 2018, the last time Runnymede sold a yearling at the September Sale for at least $1 million was in 2004. Godolphin/Godolphin Japan was the session’s leading buyer, spending $3.41 million for five yearlings. Larry Best’s OXO Equine paid $1.2 million for an Into Mischief colt out of the Distorted Humor mare Gaudete, a half-sister to Grade 2 winner and sire Munnings and stakes winner Munnings Sister. The colt was consigned by Castle Park Farm, agent. A filly by Curlin who is the first foal of Grade 1 winner Dame Dorothy, by Bernardini, sold to West Bloodstock/Robert and Lawana Low for $1.05 million. Stone Farm, agent, consigned the filly, who is from the family of Group 1 winner Mrs. Lindsay. “She’s a lovely filly, and you can’t keep a good horse hidden,” Arthur B. Hancock III said. “There’s so many good judges up here. Shawn Dugan, agent, spent $1.05 million to acquire a Pioneerof the Nile filly who is a half-sister to Grade 3 winners Cali Star and Delightful Joy and stakes winner Seymourdini. Consigned by Gainesway, agent, she is out of the Grade 3-winning Graeme Hill mare Graeme Six. The September Sale takes a one-day break tomorrow then resumes Saturday with the first of the two-day Book 2 beginning at 10 a.m. ET. The entire sale, which runs through Sunday, Sept. 23, is streamed live at Keeneland.com.